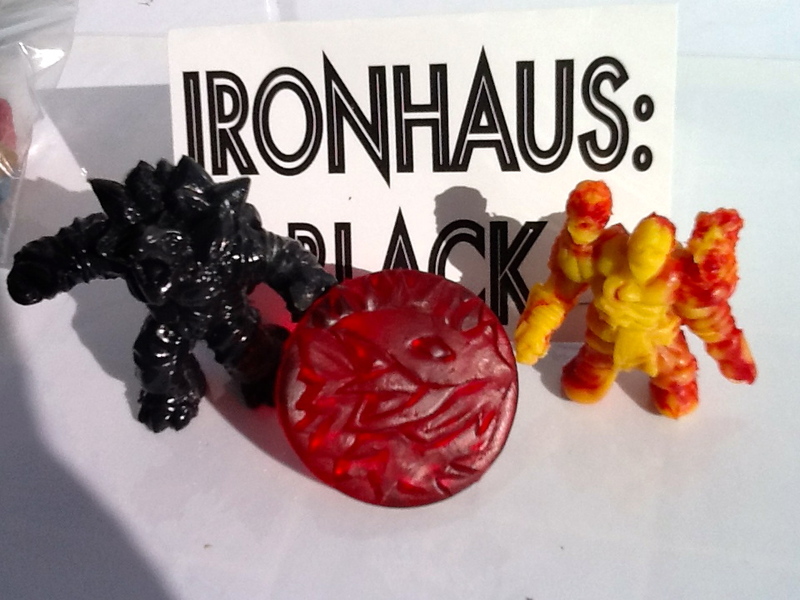 Here are some of the elusive Micro Bastards line of 1" rubber figures by Ironhaus productions. 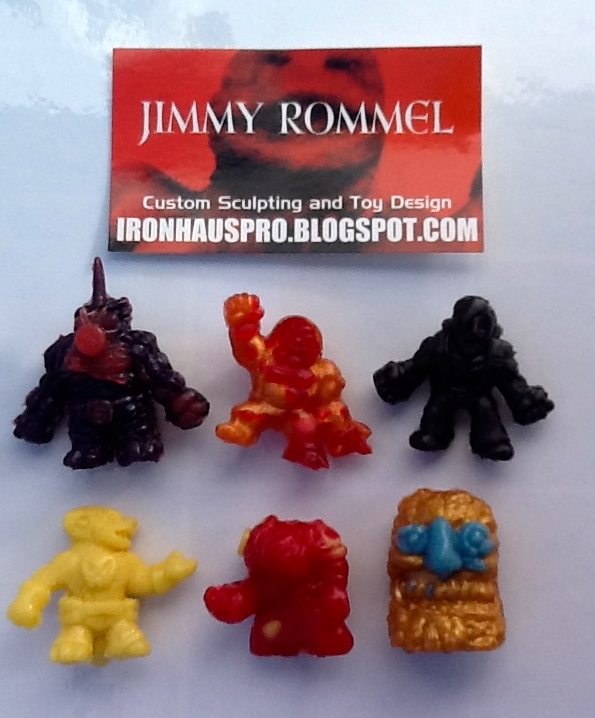 Designed, sculpted and cast by prodigy Jimmy Rommel, one of my favourite guys in the independent toy makers community who make really cool keshigomu-styled mini-figures in the same vein as the legendary Monster In My Pocket line. I was fortunate enough to get my hands on some of these guys before they were all gone (for now), don't forget these are all hand made in limited numbers and and get snapped up pretty fast so you gotta be quick. Having random chase figures mixed in makes it all the more addictive! Each set has 3 common figures, and 1 chase figure. (Above) These are the figures I got, a mix of set 1 and set 2. Bottom row - S2 ? ?, S1 Beetle Punk, S2 ??. The two unknown figures on the bottom row are from the upcoming Set2 and so far little is known about these guys so hope you enjoy the sneak peek! The reverse side of one of the new S2 figures shows how much detail these micro 1" guys really have, Jimmy has done amazing job of jamming in a lot of features like this decomposing skeleton. So where do you get these? 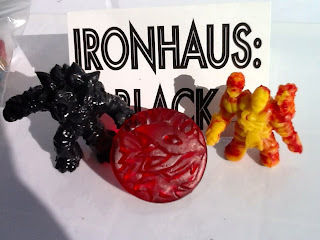 Just follow the link => HERE <= to check out the Ironhaus Pro Store. They are priced at $13 US for a set of 3 figures. Also, be on the lookout for this killer line of 2-2.5" rubber figures, Universe of Violence, being released at given times. To keep up to date with what Jimmy's up to, release schedules and more information, check out his blog here => HERE <=. UoV are also available at Eric Nilla's store here => HERE <=. Big thanks to Jimmy for these very neat figures, and getting me totally hooked on this line! 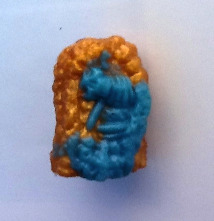 I 'm excited to see where Micro Bastards goes in the future. Great post! How cool is that gold/blue weirdo from set 2? Good to see you blogging, man. Thanks buddy! I love that S2 figure, those colours are a great combination. Great to finally be blogging too!